Our rooms vary in size and are all with panoramic views, equipped with shower or bath tub / bidet / WC / satellite TV and telephone, with the possibility of adding one or more beds. The holiday farmhouse "Isola Verde" is situated in Cerreto Guidi, nestled in between the hills of Montalbano and the river Arno. Far away from the hectic life, "Isola Verde" allows you to enjoy an authentic Tuscan lifestyle with it's famous food and wine. Because of this history, the current owner, Riccardo Tamburini, has called his farmhouse, situated in Via Callaiola, "Isola Verde" , "Green Island". The "Isola Verde" is also a farm that produces wine Cerretese typical of the hills, especially the Chianti DOCG, our customers are then invited to a free tasting of our products and may purchase them from our cellars. The farmhouse Isola Verde is located in Cerreto Guidi, a small and charming Renaissance town. 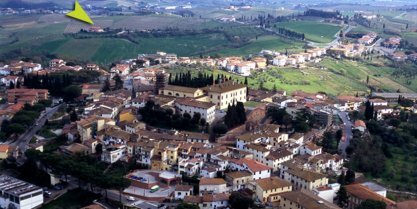 The heart of the village is the small historical center enriched by the ancient Medici Villa dating from the 16th century that is imposed on the surrounding area and its height offers a breathtaking view. Just 5km can visit Vinci, wonderful medieval fortress dating from the eleventh century and the country where Leonardo was born. Visited annually by 130,000 people, the Leonardo Museum is one of the most important museums and popular in Tuscany.